I’ve waited a long time for this. We all have, haven’t we? I finally have, in my hands, the concluding source-book of the Core Three for Fifth Edition Dungeons and Dragons, the Dungeon Master’s Guide. There is just something altogether right about having the three together at last, part of why I have never been a fan of the staggered release method actually. Complaints about the timing of the releases are something for “Past Kevin” though. Right now I’ve got my mitts on all of them, and suddenly 5th Edition is in full swing. I’ve been awaiting this since I first started toying around with the D&D Next play-test. Everything beyond this shall be considered supplemental, and it almost brings a tear to my eye. Time to dive in folks! Hello beautiful! No…I don’t mean you Acererak. The Dungeon Master’s Guide is a big book. At 320 pages it just barely beats out the Player’s Handbook for the second biggest book in the group. Binding is strong and the pages sturdy. Every bit as well crafted as its predecessors, and they’ve been just plain strong coffee this time around. A really nice touch that is only present in the DMG is the addition of a color code in the bottom right corner that represents the different parts of the book. Purple for Part One, red for Part Two, and Green for Part Three. The Intro and the appendixes are gray. Really helps you flip about when looking for something in particular. 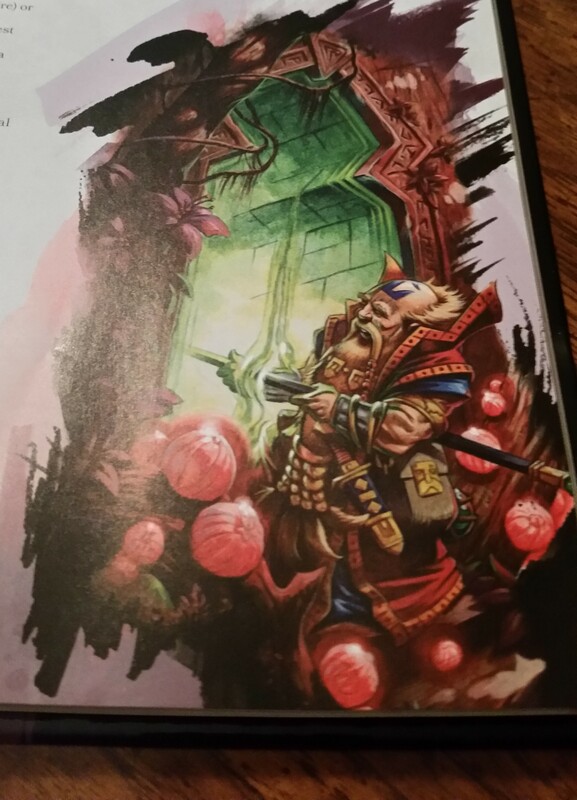 I complimented the art in the Player’s Handbook, and even more-so in the Monster Manual, but I never really expected to prefer the Dungeon Master’s Guide over both of them. 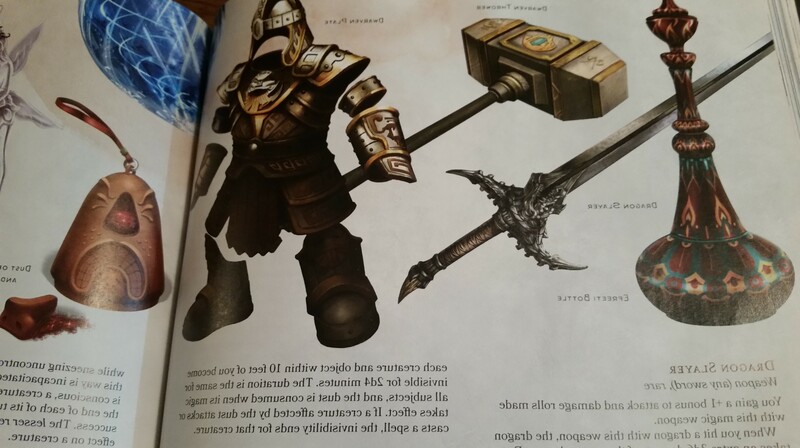 I honestly expected the best work in the Monster Manual, it is the book that requires a picture a page. The DMG has surpassed it, and the PHB though. There are scenes of truly epic proportions and even the smaller scope additions are well drawn (no weird halfling wedding DJs to be found here). I especially love the bevy of art found in the Magic Items section. Really some great looking pieces. 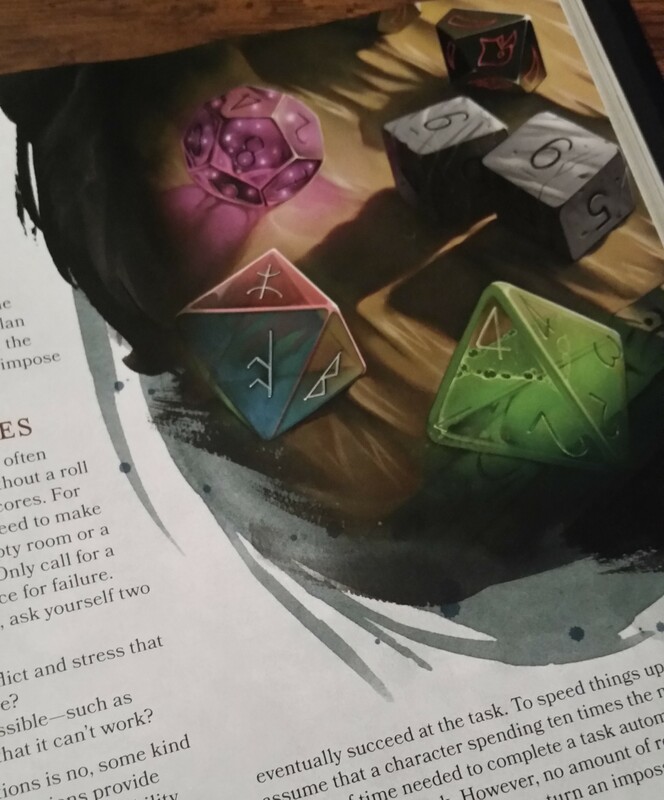 The first part of the book is an introduction that covers some of the more overreaching goals of the Dungeon Master, the ways to use this book, and a nice little snippet on the different types of players you might encounter at your table. Honestly there isn’t much here we haven’t seen before but a new DM may learn a thing or two about their role and their player’s styles. (I might also suggest a peek at my two part article on utilizing the Myers Briggs Type Indicator in your game). 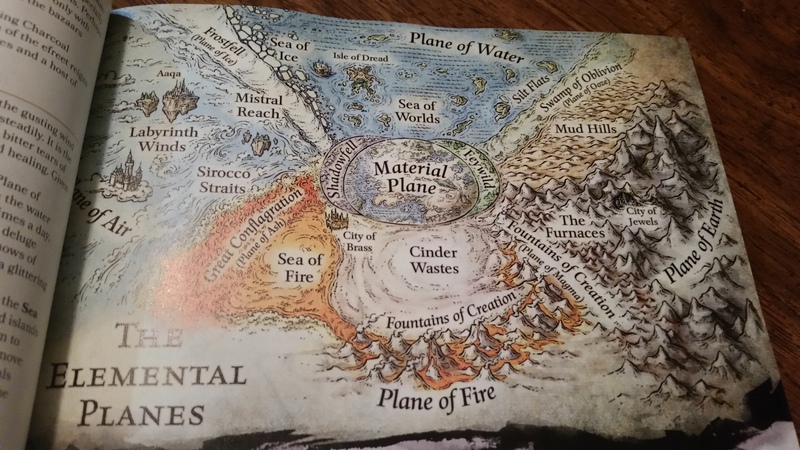 In Part One, titled Master of Worlds, we are greeted with the first two chapters that deal with first, the tools one needs to map out their own worlds and campaigns and secondly branching out into the Multiverse. Chapter one’s details on building your own campaign starts with the big picture and works its way down to the smaller details. It covers different religion concepts, helps you to map out continents, countries, all the way down to minor settlements. The religion portion does a great job of introducing religion concepts in the vein of their tropes and even the involvement of deities. Four whole pages are devoted to religion, great read too. It gives you ideas on how to work the people of your world and add in factions and then round things out with some details on the magic that flows through. After that it gets into creating a campaign, either set in your homebrew or in Feârun. This half of the chapter has a lot of useful tables for you to either cherry pick from or randomly roll on giving you a wealth of options for such things as disasters or invading forces. Throughout it there are a ton of great hints on how to start, run, and then end your campaign. In Chapter two get’s funky. It’s just a great resource for campaigns that enter into other planes of existence. I’ve frankly never spent much time sending my players to such places but I’ve also not seen it laid out this well before. Perhaps older supplements on the planes did well but I never bought them. I especially like the little snippet on how to handle portals to such places. It’s nice to see some hard and fast descriptions on how they work. The list of Planes to utilize is fairly long but my favorite part comes near the end where they discuss the “Known Worlds of the Material Plane”. Here we find some favorites such as Toril, Oerth, and even my personal favorite Eberron. Part Two, Master of Adventures, contains the nitty gritty of creating adventures for your players. They go over different adventure types, your own & published, creating NPCs, environments to play in, tools for between adventure play, and one of the most sought after portions… treasure! 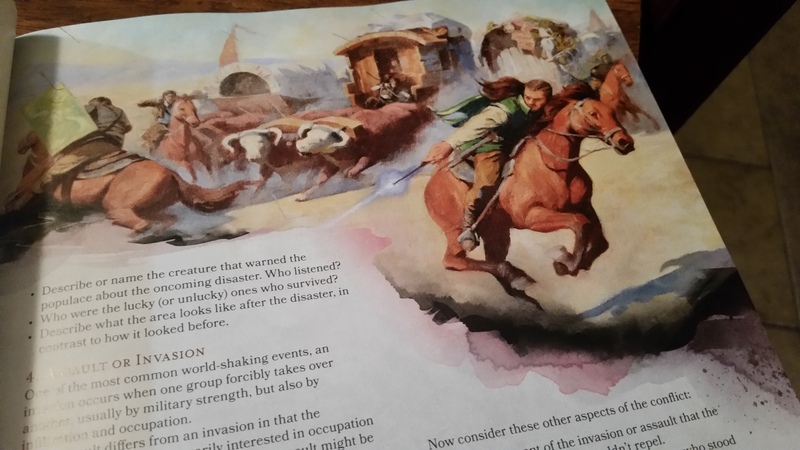 This part of the book covers chapters three through seven and every one of them embellishes on portions that enhance an adventure you may run for your group. You could utilize a new aspect picked from these chapters in every adventure you run and the well won’t go dry for a very long time. I like the details on how to set up encounters and reward characters with experience when completing them, an additional caveat for possibly awarding players experience for just spending a day “adventuring” is interesting as well. The NPC tools begin with tables reminiscent of the background crafting tools in the PHB. Nice ways to make an NPC unique if your own concepts have run dry. The middle represents some ideas for NPCs that stick it out with your group, with an interesting optional rule for tracking loyalty, and the chapter ends with yet more tables to craft some excellent villains. The “Villain’s Scheme” and “Villain’s Methods” tables are enormous! The next chapter covers adventuring environments. The environments section does a great job of not only helping you to draw up some solid areas to send your players to but also spends a great deal of time on helping you to know the background of why the place exists in the first place. I’m a story driven player so I’m always a fan of that. They explain some run of the mill locals, like the standard dungeon, and even some epic areas of play, like under the ocean itself. 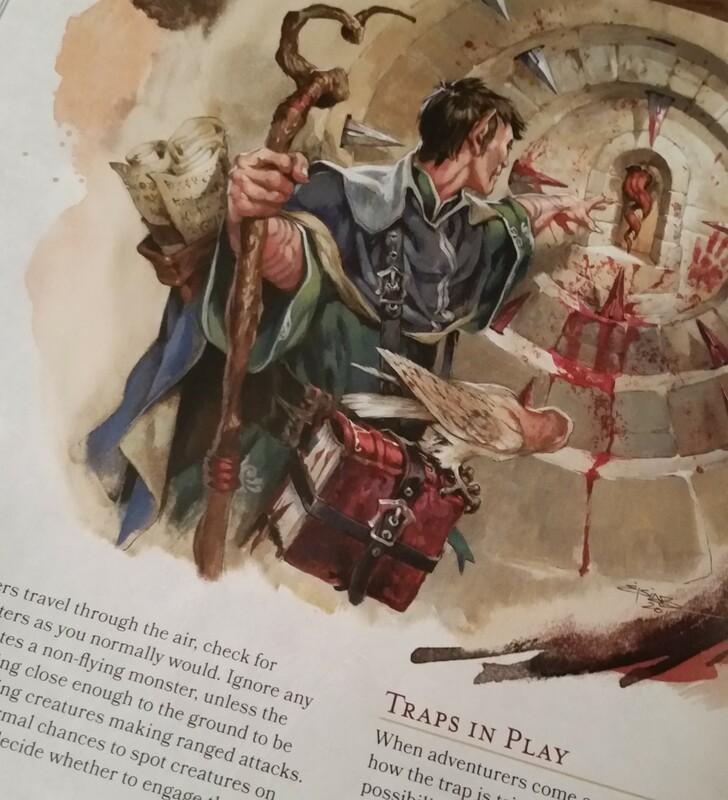 Lastly we get a few pages on a D&D staple, traps. They are solid in this edition, there are only three difficulty ratings for the players to contend with, Setback, Dangerous, and Deadly. These ratings do not mince words, deadly means deadly, the idea is your character may die from it. The sample traps are well fleshed out and they even give ideas for how to consider the level of perception needed to spot them, although in this edition the only way to keep someone from spotting something outright is to ensure it exceeds their Passive Perception somehow. You’re sticking your hand where!? Just irresponsible..
Moving on we get a chapter that is almost entirely optional, but fun nonetheless. There are some key things here like helping the DM to link stories together or plant adventuring seeds but a lot of the chapter spends time on side ventures players can tackle. Some of the tables in this chapter are just tone of fun to read and consider. Things like rules for sowing rumors, I can easily see my players trying that in my current campaign. I also really like the ideas put forth for some rules on selling magic items. I did an entire write up on my guesses for how this would be handled and I was right in that selling items would be limited, I like their tables for it. The quicker you want that item sold, and the rarer the item, the harder it’s going be to land a reputable buyer. The final piece of Part Two is treasure. We have seen treasure handled in wildly different ways over the years, as I have written about in the piece mentioned above, and this is, hands down, the best management of such rewards for players I’ve seen, in any edition. Coins, gems, and art are represented as rewards, and I can see myself using the same tables for magic items to sell the latter two, and then finally we have by far the largest chunk in the book with those, ever desirable, Magic Items. They are really magical and unique in this edition, and thus suitably difficult to come by. They are listed as common, uncommon, rare and very rare with a sizable gap between uncommon and rare. Even some of the more common magical items have a story behind them and certainly anything rare and above. There are variant rules for dealing with certain items like potions and scrolls, rules for creating them randomly if you wish, and great tables for discerning just what lay in a treasure hoard of a certain level. I can’t really express how happy I am with Chapter Seven of this book. Folks, it spans 100 pages. Nearly a third of the book. Massive deference and respect was given to tangible rewards, and you’ll have no lack of things to pull from. The “Role” of your dice is to look awesome apparently. Chapter Eight is a honing chapter. You’ve read the Players Handbook but it is here where you might go to really hone the small details of the game so you can be the guide for everyone. It actually starts out with some helpful hints on table management, veterans are likely to glaze over this but a new DM may wish to get an idea on how to handle a missing player or how to introduce a new PC. Ability checks are gone over in the minutia, Advantage/Disadvantage is brought up again, and we get a couple of pages on the use of Inspiration. I think that may be very helpful for those who want to actually use it, I’ve heard of DMs and players having trouble getting used to it and it may be nice to have a few more tips. Some of these rules probably should have landed in the PHB honestly, such as the excellent picture work on line of sight, and it makes me wonder if perhaps the PHB was shipped a mite earlier than it should of been. Diseases and Poisons are tossed in here and we get a lot of those, well fleshed out as well (though we should be used to that now). Lastly we get some really interesting variant rules for Madness, here’s an area to grant folks some Inspiration churning effects. Yeesh! Chapter Nine is really interesting. Titled the “Dungeon Master’s Workshop” it is everything you may need to either add variant rules to your games, advance technology, or even create you own monsters. We are introduced to concepts like Honor and Sanity or Fear and Horror (useful for anyone wanting to start a Ravenloft game) to really play with the minds of the PCs. There are variant rules for Resting, the addition of future technology from guns all the way to Sci Fi. Another interesting variant is the idea of a Plot Point system which appears to be D&D’s answer to some of the storytelling games out there. With these rules the players can exert a little more control over the state of the game. Not sure I’ll ever incorporate that, I have other systems that scratch that itch, but it is neat. The variant options on combat include rules for things like disarming an opponent or bringing back tumble (now just an acrobatics check). There’s even a morale system, which I seem to recall from some early D&D Next play testing. Creating/adjusting your own monsters, spells, classes, etc is going to be really fun. The tables are all very intuitive and there is large two page spread that lists all the current “Monster Features” you can mess with. 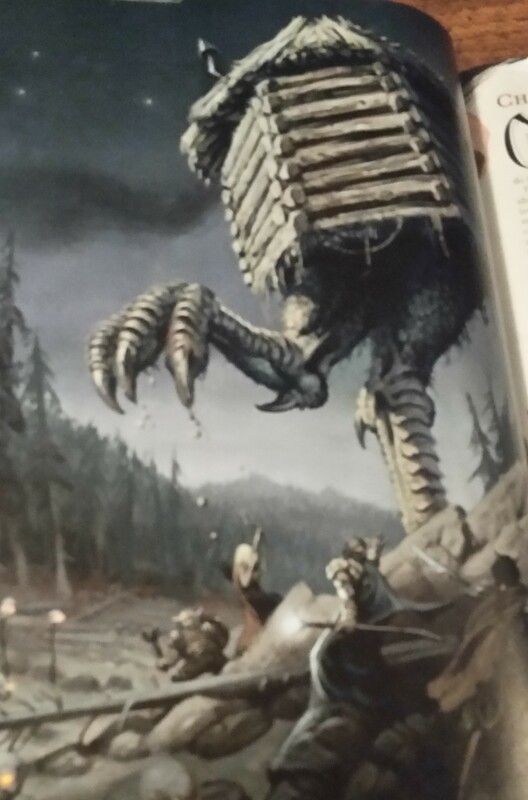 One of my favorite aspects of the digital tools back in 4th Edition was the monster builder where things like the monster features were easily interchangeable when you wanted to adjust certain monsters, this looks a lot like that. I’m excited by the prospects this holds for my own fearsome critters, or even making some iconic higher or lower level creatures match the levels I need them to. Spells are easy to adjust and there’s a table that gives you a good indication of damage they might put out per level. Magic items are touched on here as well but the bulk of that work lies back in Part Two. Finally creating/adjusting character options warrants a few pages and feels pretty all inclusive of what you would need. The last couple of important pieces to the DMG puzzle are some very useful Appendixes. Appendix A is a random dungeon generator that has so many interesting items among its tables that even if you decide to not randomize you can cherry pick from a lot of options. heel, there’s a table for d100 “Utensils and Personal Items”. 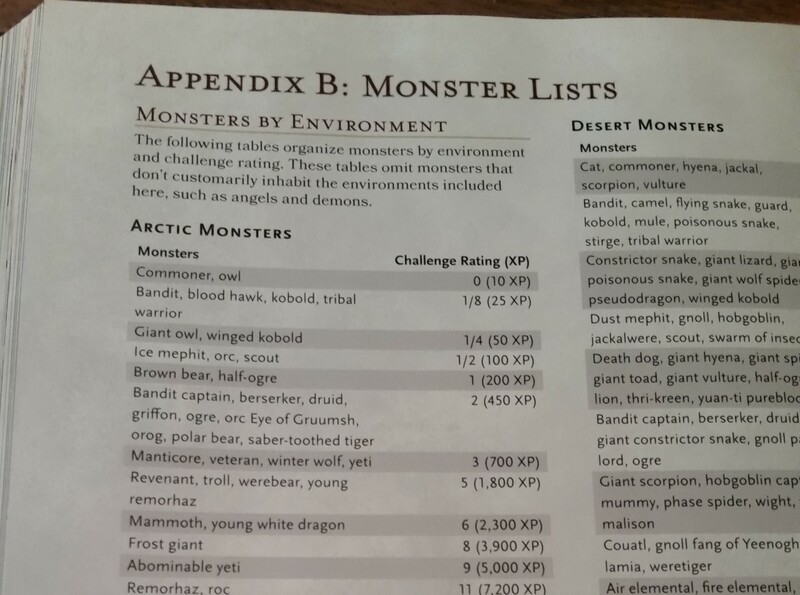 Appendix B will be the most used appendix in the book, it is here where we find the lists of monsters missing from the Monster Manual. I know why they are here instead of the MM, it’s so you can have both books open at the same time, that does make some good sense. Especially now that I actually have both books in hand (I still say they should have also included them in the MM but, oh well). There are two styles here. 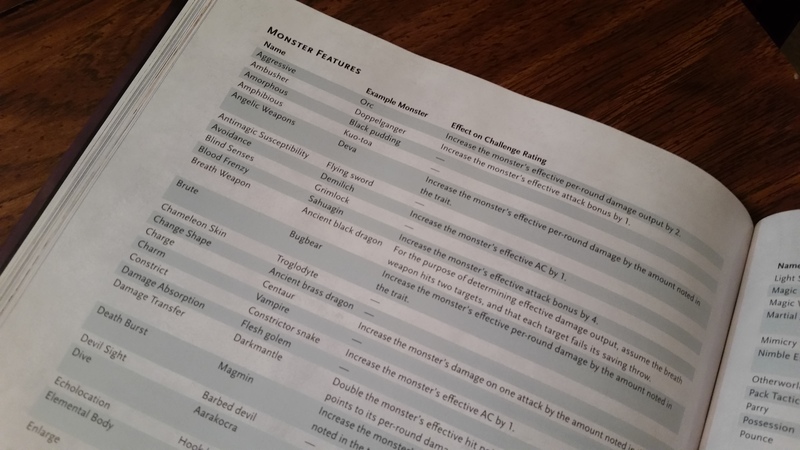 The first monster list style is a number of pages detailing monster by environment first, then by Challenge Rating. The second list is just a straight listing by Challenge Rating, sometimes that’s all you need. Last we have Appendix C. At first I thought it fairly useless, as I thought it was only a few sample dungeons but then I noticed that they actually took the time to use some common icons and made sure to use a fair number of different styled maps from dungeons to an overhead view of a boat. Still the least useful (to me anyway) appendix of the three but really nice anyhow. So. 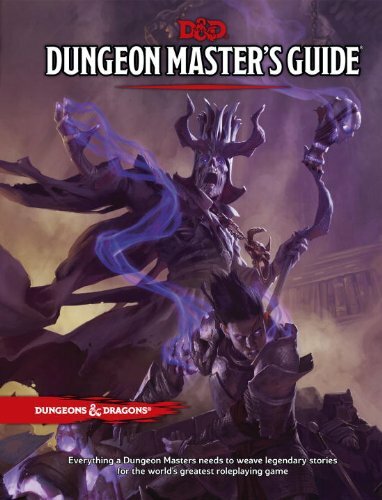 Does this book help the Dungeon Master? Even more important to me, will this book help someone brand new to the game learn to run it for a table of players? One of the main ideas behind 5th Edition is its emphasis on bringing new players into the fold, that’s part of the mindset behind releasing the free quickstart rules. I never found those rules all that easy to parse for someone new, and even the Starter Set’s adventure, “The Lost Mine of Phandelver”, wasn’t nearly as simple for a first time DM as they likely intended. The DMG certainly helps the polished DM and I’d even say the new DM, if their ready to really read the entire mass of this book they’ll come away pretty well polished. Ready to put out some truly epic adventures! I never intended to write this much. I wanted to keep things short and sweet like my Monster Manual review, but this book just warranted a deeper dive. To say I’m impressed would be an understatement, this is my favorite book of the three and I don’t think I’ve ever felt that way about any edition’s DMG. I don’t know how much the additional time gained from pushing it back helped to get it to this level of quality but whatever assisted I’m glad for it. Out of curiosity I decided to do a side by side of the 4th Edition DMG and this one, just to note where they aligned and detracted from one another. The differences could be an article all on their own. I liked 4th Edition but there is certainly a more palpable feeling of desire for a quality product in this edition. The books are bigger (320 pages here vs only 221 in 4th) and the font is even noticeably smaller in the 5e books too. The content mass is just so much larger and all inclusive this time around. It’s been a ride getting here and I’m so glad to have the core three. I’m looking forward to the smaller scale release schedule planned for 5th Edition, and I can only hope I continue to see the level of quality presented thus far in everything they put out. I have my quibbles with a few things Wizards has done lately, namely the handling of Dungeonscape, but the production quality of their books has been stellar. I can’t wait for more. Thanks for reading folks! If you feel I glossed over a part you want more on hit me up in the comments, the book is huge so I know I missed some stuff. This entry was posted in Dungeons and Dragons, Game Review, Gaming, Review and tagged Dungeons & Dragons, Gaming, Review, RPG, Wizards of the Coast by Kevin Smith(@SharnDM). Bookmark the permalink. Solid review. Thanks for posting. One thing about DMG’s that has always been a slight annoyance (if not just a necessary evil) is the almost identical rehash material for a new DM, such as how to role-play, moving the story along, etc. I’ve previously felt like I repurchased 1/3 of the book each time. It’s nice to hear that this material is still there for new DM’s, but also contains a bounty of useful material for a seasoned Dungeon Master. 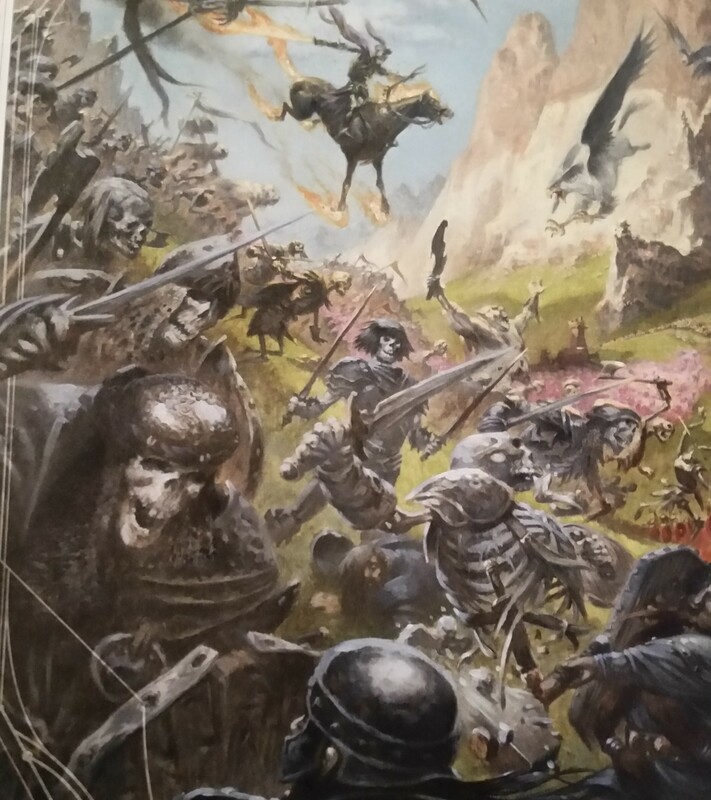 I can’t wait to set off on my first 5th edition adventure. That was always an unsaid issue I had with every “new” DMG. I can attest that this edition’s DMG leaves little unsaid. Liked how the review went through each section. At first the order seemed odd to me. Does it work for you/make sense as you flip through? I think it does work for me now that I’ve flipped through multiple times. Some areas felt like they needed their own section, like Traps for instance, but it isn’t like they needed to embellish more on those. All the pertinent rules/tips are there. I will say it seems odd to start the whole kit and kaboodle off with a section on Worldbuilding. Not exactly the first thing a DM is going to do with the DMG, especially if they are a new DM.